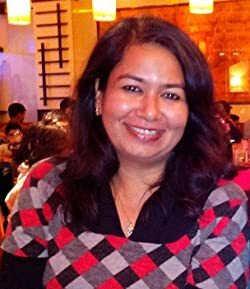 Today, at ‘Author Talk’, we have an interesting and equally enlightening column on the writing process of one of my favourite authors – Ruchi Singh. Ruchi Singh is the author of multiple books, the Winner of TOI Write India Contest, who writes in two genres – romance and romantic thrillers. Her latest book, a short story collection, titled ‘Hearts and Hots’ released few months back and has been gathering rave reviews. If you haven’t read the book, you should be reading the same today, for the book is a heart-warming, nerve soothing collection of stories, which is sure to transform your Sunday for the best. Thank you Maliny for having me on your blog and giving me the choice to choose the subject for this post. Having published two books, I thought it would be interesting to introspect on the writing process for each of them. While Take 2 has been my debut effort published in 2015, and I panstered (wrote without an outline, keeping only the characters in mind). As the story took shape I wanted a nice twist at the end which would entertain the readers. But, since it was not a planned endeavor it took me awhile to come up with a scenario which would tie up all the loose ends. It was then I decided that the next one I will outline to the last scene and then write. To an extent, I followed my resolution with novel-2, but fate always has something else planned. My next wasn’t getting anywhere near my satisfaction level, and the year 2016 was just drifting by. I was desperate to release at least one book in 2016. Along with the novel, I was also working leisurely on a short story collection and had planned to release at least ten short stories in the collection. I had thought each of them would be around 2k to 2.5k word count, bringing the collection to a decent 25k. These stories too were planned well in advance but somehow I wasn’t able to finish writing them because each of them was hell-bent on expanding themselves. So, in order to have at least one release in 2016, I switched my attention to this collection. I selected five stories from the ten, which concentrated on issues faced by women in our society. I tried to give them different flavors by focusing on different stages of love, varying age of the protagonists, changing the locational setting and even varying the writing voice. Thus ‘Hearts & Hots’ came into existence. The sequence of stages of working on short stories is iterative. For a novel, all the phases are sequential while for a collection each of the stories will span the first four stages and then publishing can be together. The short stories are written in a standalone mode unrelated to each other, which is easier in execution. But the difficult part is to come up with different plots and stick to short story format without losing the essence of the story, hence the inception phase becomes long drawn. Having said that my current WIP has been outlined as planned, but I am not able to write the scenes sequentially. The creative juices are scene-hopping. ‘Hearts and Hots’ a collection of five short stories riding on first love, passion, and romance.